In evidence here is a theme in Vincent’s letters. Still in his late twenties, he had only recently made the momentous decision to become an artist. After a row with his parents at the end of the previous year, he had moved out of the family home in the country town of Etten and set up a small studio in The Hague. Although still convalescing from a hospital stay (involving a gruesome treatment for gonorrhoea) and a fair amount of relationship turmoil, Vincent was working on his new vocation with ‘great pleasure’. Along with requests for financial support, Vincent would send Theo sketches and descriptions of the pieces he was working on. In his account of the pollard willow sketch, he is commenting on a piece that has already been made. Although the willow is mentioned in an earlier letter, it is described there as an interesting object rather than as a plan for a composition. It is not until Vincent can describe the piece he has made (and enclose a sketch for the eventual finished piece) that we get a sense of his intentions for it. In the woods, yesterday toward evening, I was busy painting a rather sloping ground covered with dry, mouldered beech leaves. This ground was light and dark reddish-brown, emphasised by the weaker and stronger shadows of trees casting half-obliterated stripes across it … The problem… was to get the depth of colour, the enormous force and solidity of that ground … to keep that light and at the same time the glow and depth of that rich colour. The sketch does not survive, although there are several oil paintings and studies of similar woodland scenes from the same period. What is different in this letter is that Vincent seems to be grappling with the problems of composition (achieving the necessary depth of colour, the management of the light) at the same time as he is making the work. Like a child thinking out loud about a sequence of play, it is almost as if Vincent is commenting aloud on his ongoing creative process. This morning I was already out-of-doors at four o’clock. I intend to attack the dustmen, or rather the attack has already begun … I have caught the sheepfold-like effect of the interior in contrast with the open air and the light under the gloomy sheds: and a group of women emptying their dustbins is beginning to develop and take shape. But, the moving back and forth of the wheelbarrows, and the dustmen with the dung forks, that rummaging under the sheds, must still be expressed without losing the effect of light and brown of the whole: on the contrary, it must be strengthened by it. The letters of Vincent van Gogh are an extraordinary literary creation. They document his work as an artist during its most sensitive and tumultuous periods. In these letters from the early 1880s, you get an impression of someone arguing with himself about what each composition needs. Indeed, it’s reasonable to wonder whether this commentary on the creative process is as much for Vincent’s benefit as it is for his brother’s. The artist is using his letters – a kind of handwritten private speech – to set out plans, choose between alternative sketches and approaches, and to pin down what is still needed from the composition. The sketches of this scene that emerged in Vincent’s subsequent letters were not based on any actual observations of potato-digging. It was June, the wrong time of year, and Vincent knew that he would have to wait another month or two to witness any potatoes being lifted. He would choose a field at his leisure, when the time came. He was imagining the scene rather than documenting it, but his letters show that that act of imagination was at least in part a verbal one. There is a stronger claim that could be made about van Gogh’s letters and their fascinating juxtaposition with what we have inherited of his sketches, drawings and paintings. Vincent in this period was developing rapidly as an artist. He was still a couple of years off producing the first of what are now regarded to be his major works (another tuber-related piece, The PotatoEaters from 1885, is generally considered to be his first mature painting). The progression described here – from the pollard willow to the woodland scene to the refuse dump to the potato diggers – represents a shift in his strategy away from using his letters to describe works that had already been made, towards using this form of out-loud thinking to plan what a work should look like. There is no question that Vincent’s visual imagination played the greater part: what else would you expect from a painter? But creating beautiful visual artworks was not, at least in Vincent’s case, an exclusively visual process. It is also no accident that these letters formed part of a dialogue. Ostensibly they are for his brother Theo: they don’t just describe developing artworks, but also Vincent’s often troubled emotions, his stormy relationship with his father and several painfully unrequited loves. 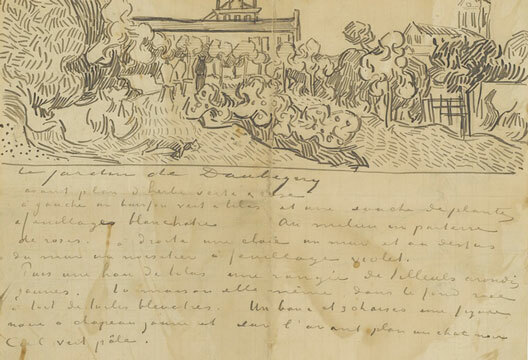 In collections of the van Gogh letters, Theo’s responses are sparse inclusions, and it is often hard to decode from Vincent’s missives what communications from Theo he is responding to. If it was a dialogue, it seems a little one-sided. Judging from the documents that survive, Vincent wrote about 600 letters to Theo over the course of his life; only about forty of Theo’s possible replies still exist. Correspondences with other family members show that Theo was an assiduous letter-writer, and he undoubtedly wrote more to Vincent than the surviving documents suggest. But even if Theo’s responses were prolific, there still is a strong sense of Vincent thinking out loud and not necessarily expecting a reply. Like a child’s private speech, the words are for the self as much as – perhaps even more than – for the other. Shenk’s analysis emphasises the dialogic nature of the creative process that resulted in the artworks attributed to Vincent van Gogh, although in Shenk’s reading it is a real, external dialogue: an exchange of letters between two brothers. We don’t know whether the letters quoted above are recording thought processes that had already happened, or whether Vincent was working out the ideas as he was setting them down. It was probably a bit of both. But I think there must also be a sense in which this dialogue carried on in Vincent’s head at times when (as was usually the case, except for a short period later in his life when they lived together in Paris) Theo wasn’t around. It is impossible to know, and it certainly cannot be divined from the letters, but it seems plausible that Vincent carried on this conversation in his own thoughts, as a fully internalised version of the letter exchange. Some kind of internalised creative dialogue must surely be a major part of any such partnership – how otherwise would anything get done? Lennon was not limited to being a musical genius only when McCartney was in the room, and vice versa. Creative partnerships (of which the history of various art forms is littered with examples) may come to have their power at least in part because the artist recreates an internalised version of the actual dialogue that would have taken place over cups of tea and cigarette breaks. I would go further and say that, once established, the inner dialogue develops to a point where it no longer needs the other contributor. Leaving aside the requests for cash, I doubt that Vincent would have stopped writing in this way even if Theo had been dead for several years. (He might presumably have put all of the commentaries into his journal, and thus saved himself some postage.) As Shenk notes, Vincent certainly struggled to find the right distance from his brother: his early letters were full of longing to be near him, but when they were together they often fought. Like a child’s private speech, the letters are ‘parasocial’: open to the possibility of a response, even if one is neither expected nor needed. There’s another sense in which van Gogh’s letters illustrate Vygotskian views about the use of language in self-regulation. Vygotsky argued that, if it has a genuine self-regulatory function, the speech that accompanies action should, over the course of development, shift its position in time relative to the behaviour. From an early stage in which children’s self-directed speech merely accompanies and describes ongoing actions (‘I’m building a train track’), it develops into speech with a clear planning role, appearing before the behaviour in question (‘I’m going to build a train track’). Although this developmental progression has been hard to document empirically in children’s private speech, some trace of it seems to be there in Vincent’s letters. ‘I am painting a woodland scene’ becomes ‘I am going to paint some potato diggers’. Linguistic, dialogic, shifting between externalised and internalised forms: dialogic thinking seems to be a useful tool for creativity. An oft-abused buzzword that can be an emblem of some very woolly thinking, the idea of creativity – which we can define as the production of the ‘new, beautiful, and useful’– is one of the most elusive and mysterious of human abilities. Creativity is not necessarily about the arts. Scientific research the kind that shifts paradigms but also the sort that finds an ingenious solution to a local problem – requires dollops of the stuff. It involves going from what is known to what is unknown; from what is old to what is new. It is a kind of thinking, but one in which you don’t know where you are going until you get there. That open-ended quality of the creative process has been one of the obstacles to understanding it scientifically. Psychologists like to work with tightly specified paradigms with definite boundaries: such control over events is arguably essential to the experimental method. How on earth do you get a scientific grasp on a process that has no clearly defined end point? It doesn’t stop psychologists from trying. Many lab hours have been spent with versions of the ‘candle’ problem, in which participants have to work out how to suspend a lighted candle using only a small range of props (book of matches, box of thumbtacks, corkboard) so that the wax doesn’t drip on to the table below. The candle problem is usually seen as a test of people’s ability to ‘think outside the box’, by employing objects for uses other than those for which they were intended. (Spoiler alert: in this classic problem in the psychology of creativity, you simply retrocon the tack box as a candle-holder and fix it with the thumbtacks to the corkboard.) On one description, the task requires you to be open to an alternative perspective (use the box as a candle-holder, rather than as a receptacle for the thumb-tacks). If you approach this task by thinking in words, you might find it useful to ask yourself questions and then answer them: ‘Why not use the box for something else?’ ‘Like what?’ ‘I don’t know – stop thinking of it as a container for the tacks. Try another use for it.’ Many other creative moments might be similarly characterised in terms of an openness to another way of looking at things, a willingness to hold a particular perspec- tive in mind and respond to it with another one. As we’ve seen, that’s a pretty good definition of the ability to engage in mental dialogue. Thinking about creativity as a form of dialogic thinking helps us to understand that flexibility. Dialogue is creative. You may have some idea of what you are going to say, but you sure as hell don’t know what your interlocutor is going to say, at least until your own utterance is out there. And once it is out there, you may not actually need your interlocutor. All you need to do is respond to that initial utterance as if it had come from another person, and you’re on your way to having a conversa- tion with yourself. Is there any evidence that thinkers use dialogic inner speech to solve these creative problems? This is where the science gets tricky. As we have seen throughout this book, it’s very difficult to get a window on to people’s thought processes. Van Gogh himself seemed sceptical of the idea that we wear our minds on our sleeves: ‘Do our inner thoughts ever show outwardly? There may be a great fire in our soul, yet no one ever comes to warm himself at it, and the passers-by see only a wisp of smoke coming through the chimney, and go along their way.’ You can gather so-called ‘thought protocols’ from people who have done a creative task, essentially asking them after the fact what their thought processes were and how they went about solving the problem. But these can only ever be rather belated reconstructions of what went on. With further developments in experience sampling, it might be possible to probe people as they are pondering and thus capture the flavour of the thought process at the crucial moment. But any such methodology would risk destroying the very process it was meant to be investigating. As the famous story of Samuel Taylor Coleridge and the visitor from Porlock illustrates, creative processes (in this case, the composition of Coleridge’s unfinished masterpiece ‘Kubla Khan’) are notoriously sensitive to distraction. Documenting the arrival of creative insight as it happens will never be an easy matter. Instead of trying to capture creativity as it occurs, another approach is to look at differences between individuals in how much they engage with dialogic inner and private speech. Again, the relevant studies have yet to be done. One bit of evidence suggests that children who use more self-regulatory private speech score higher on standard measures of creativity than their peers, but no studies have yet tried to relate creativity to inner speech measures or indeed to specific subtypes of inner speech. Give the pre-war atmosphere. Ott. Duncan. France. Letter to Bridges about beauty and sensuality. His exactingness. Logic. Woolf’s first ‘Suppose I …’ is a question addressed to the self: what follow in her handwriting are possible answers. They show all the qualities of compression and abbreviation that we see in her contemporary James Joyce’s depictions of inner speech. As we’ll see later, Woolf was not averse to talking to herself out loud as she worked on a problem in her fiction; here we see that her dialogic inner speech found another external expression, in this case on the crowded pages of her notebook. Perhaps there’s a way of understanding writers’ notebooks as a condensed version of the kind of expanded creative dialogue that is in evidence in van Gogh’s letters. In whichever form we do it, there are good psychological reasons why conducting dialogues on the page might benefit the creative process. If I’m doing my thinking in writing, as opposed to silently in my head, it will have the benefit of reducing my processing costs, particularly the demand on working memory. For one thing, if I’ve written my question down, I don’t have to divert mental resources towards holding it in memory while I think of how to answer it. The notebook page becomes an external version of the ‘open slot’ in which we park a perspective while generating a response to it. Giving our thoughts a material, external form helps to cut down the amount of work we need to do to process them. Something similar happens when we think out loud in private speech. Rather than having to hold a perspective silently in my head, I can voice it out loud and know that it will resonate for a while in my auditory memory. Speaking our thoughts aloud, like writing them down, appears to be a handy way of cutting down the resource costs of doing it all in inner speech. That issue of processing cost may be the secret to understanding the power of dialogic thinking. Creativity involves bringing bits of information to bear on a problem that may not be obviously relevant (thinking about a tack box as a candle- holder, for example). As soon as you express one perspective in words, you drastically constrain the range of possible dialogic responses to it. Conversations have to be about the same thing, or they are not really conversations. The philosopher Daniel Dennett illustrates this point by asking us, ‘Have you ever danced with a movie star?’ To answer this question, you don’t have to run through a list of every single person you have ever danced with, and check to see whether any of them are Hollywood A-listers. You simply have to put the idea out there, in a question aimed at yourself, and then answer it, through what Dennett describes as ‘relatively effortless and automatic’ reasoning processes. It may be that something about the linguistic act of posing a question to yourself can make your intentions about what you are planning usefully clear. The linguistic structure of Woolf’s self-questioning ‘Suppose I …’ might have nudged her into being more determined about what she really wanted from the work she was thinking through, possibly more than she would have been if she had simply declared the thought as a statement (‘I shall …’). This idea was tested in a study by the psychologist Ibrahim Senay and his colleagues at the University of Illinois at Urbana-Champaign. They gave participants a task involving solving anagrams, but asked them to prepare for it in silence either by asking themselves questions about what they were about to do, or by simply making statements about it. When they were instructed to question themselves silently, the volunteers solved more anagrams than when they merely declared their plans to themselves in inner speech. The researchers concluded that quizzing yourself in self-talk can push you beyond what you might otherwise achieve if your inner speech was full of bald statements of intention. Writing novels and solving anagrams are of course tasks that involve manipulating language. The striking thing about van Gogh’s example is that he was using language to create works in a visual medium. But words can do that. Some have argued that language has a special ability to integrate streams of information that would ordinarily be processed by separate cognitive systems. For example, data about geometry (how objects are laid out relative to each other) are thought to be processed by a cognitive ‘module’ that is entirely different from the system that processes, say, colour. In which case, how are we ever able to integrate the two kinds of information? As an illustration, think about how you might use data about colour to help you to navigate around an environment, such as in processing an instruction like ‘Turn left at the red house’. If two completely different modules are involved, how do we get them talking to each other? One answer is that we use verbal thinking. At least one study has shown that, if you block inner speech, participants lose the ability to make these kinds of integration. Preventing people from using self-directed speech has also been shown to affect people’s more basic perceptual abilities. When volunteers were asked to search for a particular object among an array, such as a selection of items on a supermarket shelf, they did better if they spoke the items’ names aloud as they were doing so, at least if the items were reasonably familiar. Something similar seems to apply to the ability to sort objects into categories according to colour, for example, while ignoring other properties of the object, such as shape. It doesn’t follow from this that the language you speak can actually change the categories through which you perceive the world, as versions of the controversial ‘linguistic relativity hypothesis’ propose. Rather, it suggests that directing language at yourself can make it easier to operate with the categories you already possess. All of this points to a role for inner speech in processing kinds of information that would seem to have nothing to do with language. We’ve seen that self-directed speech has a role in planning behaviour and controlling it when it is in progress. What’s at stake here is whether we can go a step further, and say that inner speech can tie together aspects of our cognition that might otherwise remain separate. That’s a view that some researchers, like the philosopher Peter Carruthers of the Univer- sity of Maryland, have arrived at. Carruthers has proposed that inner speech is a kind of lingua franca in the brain, able to integrate the outputs of systems that would otherwise remain relatively autonomous. If that view is correct, it might explain how van Gogh’s words could get some traction on the visual images he must have been manipulating as he planned his compositions. The pictures spoke the language of his inner speech. - The Voices Within: The History and Science of How We Talk to Ourselves by Charles Fernyhough is published by the Wellcome Collection and Profile Books at £16.99 hardback and £14.99 ebook.